In my last post, I mentioned gathering staff together for meetings. Making sure these meetings are occurring regularly and conducted in an efficient way is very important to your business. Some companies hold meetings weekly, monthly, or even have as a 5 minute get together each morning. You can have meetings every morning within departments where everyone is brought up to speed about current goals and tasks, weekly meetings gathering the managers and department heads to talk about improvements and what is working, even monthly meetings just to go over that master list. Meetings are a very important tool in business, especially when you have a growing number of staff. They are the most effective way to communicate with your team keeping everyone on the same page and moving towards the same goal. Complaints and grievances can even be brought to higher up attention, so they can be rectified before becoming a larger concern. How you schedule your meetings is completely up to you and what is best for your company. Be realistic with the plan to ensure you have the proper amount of time to attend. You can even make an operation manual specifically for meetings and how they are to be held in your absence, or within departments. Whenever you plan on scheduling them, just be sure they have a purpose and a direction. That purpose can be just to boost moral and create a line of communication, or the purpose can be to delegate and plan. Whatever the purpose, these are important times and should be handled in a business fashion. Make sure that times for these meetings are posted and everyone who is to be attending is made aware. Set specific times and make sure you stick to them. Close that door on the conference room so staff know not to be late and you will improve attendance. Set an end time and stick to that as well. Al Levi gave specific guidelines, 10 actually, to help business owners get a good handle on the importance of meetings as well as ensure the time is used properly. This means delegating someone specific either at each meeting or someone who will permanently hold this position. It also means you must come to the table with the purpose already made and an agenda in hand. You can make these agendas ahead of time and pass them out to the people who will be involved so they have time to review it if there is a lot of information. If these are daily department meetings, you may just have a short page you want the managers to address each day or even just give safety information if it is in a warehouse. The main point is to be prepared so these meetings can stay on track and address areas that need to be. I mentioned this above. How you plan your meetings will help you decide what to put on your agenda. If it is a regular meeting, you may just have an outline that you follow for each meeting. Writing down new topics or things to address when necessary. Remember to always consider who is attending and how often these items really need to be addressed. In many cases this is an assistant “taking minutes” as it is called. You can even record these meetings and have someone type them up later to make sure that no one missed any information while writing. Meetings should have definite beginning and end times. You can break down larger meetings into smaller ones. 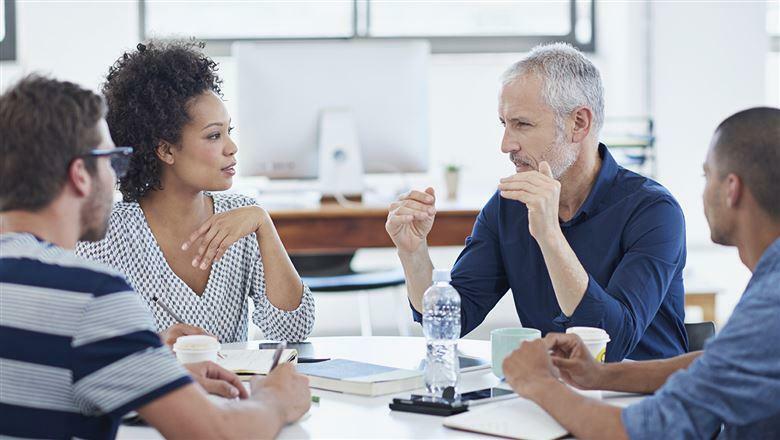 Have a meeting with your managers and department heads and then have it broken down into department, so each department can have a meeting like the first. There are many ways to accomplish this, but it goes back to make sure you are considering who is at the meeting when making the agenda. Meetings are sacred and not to be disturbed unless absolutely necessary. Putting a sign on the door or even placing a sign in the window stating that there is a meeting going on helps deter people from knocking on the door. Also make sure that you have delegated any other source of disturbance such as someone or some way to answer calls, someone to greet vendors that may show up during that time, etc. Even if you must make sure the meeting is held at a certain time or on a certain day to keep disturbances from happening, you need to make sure this time is for the meeting. Shorter more frequent meetings are better than longer meetings held less frequently because you will more easily sustain peoples’ attention. Just as you should avoid disturbances to keep everyone from becoming sidetracked, having a short to the point agenda and keeping the meetings to only what is necessary for the meeting will help everyone involved stay focused and on task. You want everyone to leave the meeting having accomplished what was on the agenda and to remember what was talked about. This will help them stay focused on these tasks as well as pass them on to employees next in line correctly. A round table or tight square table will increase equality and promote better listening. While you are the boss, people want to come to meeting where they can be heard as well as seen. You can try bringing doughnuts and coffee to early morning meetings. Consider the time of day, maybe provide lunch after or snacks and refreshments. Keeping everyone close together will keep anyone from having to strain to hear as well as speak. A well-appointed meeting room, with comfortable chairs, good lighting, and multimedia items such as a tv, whiteboard, flip chart, and internet access will maximize potential for productive meetings. No one wants to sit in an uncomfortable chair for any period. They will constantly be moving around and be distracted. Proper lighting is important to help everyone see exactly what is being talked about if you are projecting it as well as who is talking. Al’s advice on meetings has helped many business owners communicate more efficiently with their staff as well as accomplish more through an efficient meeting system. Another great example comes from Tommy Mello and A1 Garage Door Service. He has what they call the morning Mojo call. He explains that for 20 minutes every morning they have a team meet in their designated conference room. They even include their remote employees having them join through a conference line. Tommy uses this meeting to get everyone on the same page, do some role plays, celebrate wins, and reinforce the company values. Accountability: Everybody gets to see what the guys’ (technicians) average tickets are. Updates: Managers give updates on the CRM (Customer relationship management) systems and technology, go over sales, and so on. Role-playing: During this section, he pulls somebody to the front of the room and goes over different selling strategies. He calls this role playing and states that it is the most effective tool in their sales playbook. One role play game they all love is to see who can always answer a question with another question. After each role play, they give each other feedback and ideas. Celebration: They review and celebrate the five-star Yelp reviews and the happy customer letters they have received. Values: They also like to take time to reinforce the importance of ethics and honesty in everything that they do. Ethics and honesty are two concepts held very closely to Tommy and his company. He believes in growing a company and making money of course, but that there are honest and ethical ways to do so. You don’t have to be that stereotypical used car salesman customers often think of with sales.